August 27 saw the worst riots in UP in decades. Chief Minister Akhilesh Yadav failed to contain its spread, and is now faced with possible alienation of the minority community, which has not missed the fact that there were 27 riots in the first nine months of the govt. FOR 19-year-old Iqra, a student of history in Lucknow University, the fact that nine columns of the Army are holding fort in villages and bylanes of the communal strife-torn districts of western Uttar Pradesh is something she had only read about in textbooks. IF the elections are held today, the SP would learn to its horror that its calculations have gone awry. An insecure Muslim community is not thinking of it as its saviour any longer. But it may not be true six months from now,” says Shahnawaz, an SP supporter from Kairana. THE 18-month-old SP government has the dubious distinction of reporting over 100 communal incidences, including a dozen major cases of rioting, which have left at least 77 persons, including 43 in the recent Muzaffarnagar clashes, dead. FOR 19-year-old Iqra, a student of history in Lucknow University, the fact that nine columns of the Army are holding fort in villages and bylanes of the communal strife-torn districts of western Uttar Pradesh is something she had only read about in textbooks. As a child, she recalls watching the Army in action at Kargil on television. More recently, she saw its heroic role in rescuing victims of the Himalyan tsunami in Uttarakhand. But calling it for controlling communal riots? For a generation born and brought up in the post-Babri Masjid-Ram janambhoomi liberalised India, the Army being called in to assist the civil authorities in cases of civil strife is a new experience. It brings back unpleasant memories for the scarred generation before them. The summoning of the Army for the first time in 21 years is not the only factor that sets Muzaffarnagar apart from other recent incidents of communal strife in Uttar Pradesh. Sociologists describe communalism as a largely urban phenomenon, with Gujarat 2002 being an unfortunate exception. This is the first time after two decades that such concentrated communal violence is being witnessed in the rural areas of so many districts at the same time. “Even during the Partition, my Baghpat did not witness any tension. This is a terrible experience,” says former minister and Rashtriya Lok Dal (RLD) leader Kakob Hamid, one of the architects of the famous Muslim-Jat unity in the area that is the backbone of the party. To understand the genesis of the communal tension it has to be juxtaposed with the banning of the VHP’s 12-day 84-kosi yatra in eastern UP between August 25 and September 13. The arrival of Amit Shah, Gujarat Chief Minister Narendra Modi’s aide, as UP in charge of the BJP in June 2012 is a factor that cannot be ignored. His mentor’s road to New Delhi passes through Lucknow and Shah did not leave any stone unturned to polarise the political scene in the state to his advantage by systematically strategising on where to strike. On August 17, a delegation of VHP leaders, including Ashok Singhal, met Samajwadi Party president Mulayam Singh Yadav and Chief Minister Akhilesh Yadav at his official residence in Lucknow. The meeting lasted over two hours and was clearly not just a “courtesy call”. What transpired during the meeting is not known, except that the delegation apparently asked Yadav to intervene in the Babri issue and persuade the Muslims to allow them to build the Ram temple. 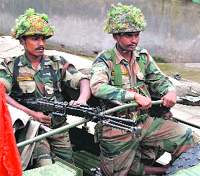 The Army was called in for the first time in 20 years in UP. Reacting sharply, the very next day, Additional Advocate-General Zafaryab Jilani, also a member of the All India Muslim Personal Law Board and its committee on Babri mosque, met the senior Yadav to reiterate that there was no scope for any negotiation as the matter was sub-judice. Senior minister and the Muslim face of the SP, Mohd Azam Khan, also criticised Mulayam Yadav for meeting VHP leaders, saying it was a betrayal of the Muslims who had brought him to power. The SP decided to ban the VHP yatra, scheduled to pass through Faizabad, Barabanki, Ambedkar Nagar, Gonda, Basti and Bahraich. The fact that the Congress represents most of the parliamentary seats in these districts is no small coincidence. Of the total 22 parliamentary seats that the Congress won in Uttar Pradesh in 2009, roughly 15 seats fall in the periphery of the yatra route and its sphere of influence. A minor change of dynamics has the potential to change political fortunes. The state government blocked the Lucknow-Faizabad highway and kept strict vigil on trains, buses and airports to prevent ‘sadhus’ from reaching Ayodhya. The state government summoned 12 companies of the CRPF and SSB, 10 companies of the RAF and 12 companies of the PAC. One company each was sent to the other sensitive districts of Meerut, Agra, Rampur, Kanpur and Gorakhpur. Another three additional SPs, 10 DSPs, 55 Inspectors, 190 Sub-Inspectors and 1,300 constables were also keeping vigil. This massive arrangement made Ashok Singhal to quip that he wished similar preparedness was shown to drive out the Chinese when they intruded inside the Indian borders. On the D-day, thousands of ‘sadhus’ and VHP supporters headed for Ayodhya were arrested in full media glare. This included several high-profile VHP leaders like Ashok Singhal and Parveen Todagia, Ramvilas Vedanti and Swami Rambhadracharya. The drama of their arrest was shown live on national channels, fuelling a debate about the SP government harassing the saffron brigade to appease the Muslims. The message was loud and clear — the government would not hesitate to take action against the saffron brigade. By appearing to act tough by preventing a handful of VHP supporters from undertaking the yatra, the government served to resurrect a comatose VHP. It brought it much-needed publicity after a series of flop mobilisation efforts in the recent past. The BJP reiterated its charge that the SP would go to any length to please Muslims. Around the same time, on August 27, 450 km away at Kavaal village of Muzaffarnagar an incident took place which would have been dismissed as a brief news report in the daily crime section. A fight reportedly broke out when two brothers stood up against their sister’s harasser. All three youths were killed in the incident. Within hours, the SSP and District Magistrate of Muzaffarnagar were transferred and force deployed in the village. Using this incident to his advantage, a Gujjar BJP leader, who had lost the Lok Sabha polls in 2009 from this area, drove a wedge between Jats and Muslims by giving the incident a communal colour. With the help of the politically ambitious Tikait brothers, he organised the ‘bahu-beti wa Hindu bachao mahapanchayat’ at Nagla Madaur on September 7. The role of the Uttar Pradesh DGP, a fellow Gujjar, in allowing the mahapanchayat is suspicious, considering that he was stationed in Muzaffarnagar to prevent riots. Using the emotive issue of the honour of its women, the BJP and BKU leadership has attempted to break the long-standing Jat-Muslim unity by drawing the Jats to the saffron party and consolidating votes on the basis of religion, and not caste. “Threat” to the motherland, women and cows was amalgamated to raise offending slogans, threatening the Muslims to leave the country. This made the Muslims attack people returning from the mahapanchayat, starting the worst riots in recent history. The VHP bogey of “love jihad”, an imaginary plot of Muslim youths wooing and converting Hindu girls to Islam, made it worse. Given that the riots apparently started with the molestation of a Jat girl, it made the volatile communal cauldron of western UP explode, claiming 44 lives. Modern technology was used to the hilt to spread false propaganda. The police admits that the biggest challenge is to check rumours spreading through fake video clips being widely circulated on Facebook, Twitter, WhatsApp and even through SMSes. While the police has announced an award of Rs 1 lakh for anyone providing information about the people behind the riots, the BJP Sardhna MLA, Sangeet Som, was booked for having reportedly uploaded a fake video. But he is yet to be arrested. The India of the 1980s and early 1990s and today are two different places. News could be censored in the times of state-owned television and radio. Today, this is impossible as there are over 400 news channels and nearly 1 lakh newspapers along with nearly a billon mobile phones and tens of millions of Internet users. No political party or individual is immune to the adverse publicity that it generates. Such myopic strategies may bring short-term gains for political parties, but in the long run, it is the nation’s loss. These incidents happened earlier as well and were treated like cases of crime. Nowadays these get communalised because of political forces. This is the main problem. Jayant Chaudhury, Mathura MP and RLD leader Ajit Singh’s son. Four persons killed and 16 injured at Kosi Kalan, Mathura, after a man urinated and used water kept for ritual cleansing before Friday prayers. Rumours of Jat girls kidnapped, raped by Muslims led to riots, reportedly instigated by former BSP minister and his MLC brother. Over 150 shops damaged. At Bareilly, three persons were killed over playing of music near a place of worship. Curfew imposed from July 22 to August 7. On August 11, two groups clashed after a Janmashtami procession was stopped. Curfew re-imposed. In Ghaziabad, six persons killed in clashes after a sacred book was allegedly desecrated. 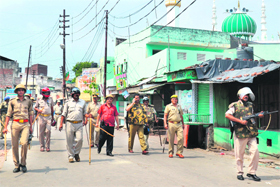 Trouble began in Faizabad after reports of throwing of colours on a mosque. Rumours that a Durga idol had been damaged sparked off violence, killing two. Shops gutted, causing losses worth crores. Quarrel broke out at Kavaal in Muzaffarnagar, after reported teasing of a girl, leading to the culprit being stabbed to death by her brothers; who were lynched. Despite imposition of Section 144, the administration allowed mobilisation efforts. Situation exploded after the August 31 condolence meeting for the two brothers and the September ‘bahu-beti bachao mahapanchayat’ at Nagla Madod. If there is any method to the madness which continues to rock the seven districts, it revolves around the 18 Lok Sabha seats of the region, as the time for re-dividing the spoils is round the corner. 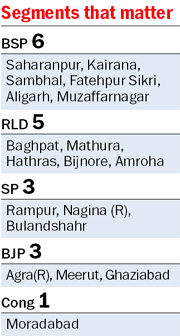 At present, Ajit Singh’s Rashtriya Lok Dal and the Congress together hold six seats while another six is with the BSP. The SP and BJP hold three seats each. The crime of commission and omission committed by the BJP and SP in Muzaffarnagar was aimed at turning this equation to their respective advantage by polarising the voters. Recent history proves that communal violence helps consolidate Hindu votes, helping the BJP, while the Muslims were expected to turn towards the SP on whom they are dependent for protecting their life and property in the state for the next over three years. Ever since the RLD joined the UPA government in 2011, the BJP has been attempting to undermine the Jat-Muslim unity in Uttar Pradesh, which together promises a sizeable number of seats. The two communities have close historical and social links which Chadhury Charan Singh had successfully built into an enduring political alliance that is still bearing fruit for his party and family. A section of the Jat community under Mahendra Singh Tikait’s Bhartiya Kisan Union (BKU), perturbed over the rise of the Dalits under the BSP, had moved closer to the BJP in the 1990s. However, it could not be converted into electoral success. The recent riots in Muzaffarnagar were clearly an attempt by the BJP-BKU combine to reap political benefits by snapping the Jat-Muslim unity and consolidating the Hindu votes. RLD leaders in the area claim it is too early to write off Ajit Singh. His leaders are already moving in the area trying to build bridges between the two communities, making them see the designs of the BJP and SP ahead of the Lok Sabha polls. The party, which had managed a landslide victory of 224 seats in a House of 404 on the invincible Yadav-Muslim formula, has left Muslims feeling short-changed. In Muzaffarnagar and its surrounding villages, around 50,000 families fled and are living in government-sponsored shelters. Many more have found shelter with relatives, in schools, ‘madarsas’ and houses of influential people. Considering nine births took place in a relief camp at Shahpur in Muzaffarnagar, the scale of displacement can well be imagined. 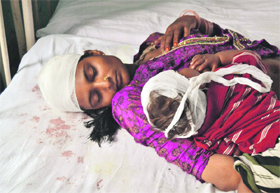 Many lives have been lost in communal strife and hundreds have been injured. 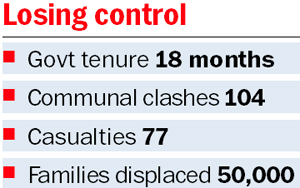 As per a Union Home Ministry report of November 2012, Uttar Pradesh saw 104 cases of communal tension and clashes from January 1, 2012, to October 31, 2012. Around 34 persons were killed and 456 injured. Major incidents were reported from Bareilly, Pratapgarh, Mathura, Faizabad, Ghaziabad, Moradabad, Meerut, Bhadohi, Kanpur, Allahabad and Lucknow. On March 7, 2013, Akhilesh Yadav admitted to 27 cases of communal violence — from the date his government took over on March 15, 2012, till December 31, 2012. He gave the details in a reply to a question raised by BJP MLAs Satish Mahana and Lokendra Singh, and Peace Party’s Dr Mohammad Ayub in the Vidhan Sabha. Among these were three major incidents that occurred at Mathura, Bareilly and Faizabad. Seven incidents of communal violence took place during the period, including two at Pratapgarh, and one each at Ghaziabad, Bareilly, Sambhal, Bijnore and Allahabad. The laxity of the government is visible in all cases. After the September 2012 violence in Ghaziabad, the Home Ministry and the Intelligence Bureau sent a specific advisory to the UP Government, warning it of similar communal outbreaks in other cities. Yet, the very next month there were riots in Faizabad for many days, claiming four lives. The government is prompt in transferring officers, slowing down the control of violence as the new team takes time to settle down. Hours after the Kavaal incident, the Muzaffarnagar SSP and the District Magistrate were transferred. Their replacements took time finding their feet, causing administrative vacuum at a critical time.